Sorry, ORM belongs to GAC. I am posting early, I may update tomorrow. The Kaufman Herald has news important news about the Kaufman ISD schools closing because of the swine flu. 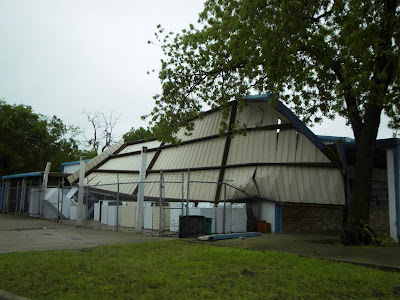 Terrell ISD is business as usual....for now. I am thankful I do not have kids, because I really do not understand whats going on with the H1N1 virus (that's the PC name for swine flu, but I don't want to offend any pigs). I read just an hour ago on CNN that the swine flu is no worse than the regular flu. That it may die down and come back stronger in the fall. What happens if it does come back? Are school officials prepared to close school down again? I also heard today that schools that are scheduled to open next week may remain closed. Is that helping? Another rumor was the days missed will not have to be made up and the districts will not lose any funding. How many of these kids that are not going to school are having to go to Grandmas because Mom and Dad cant get off work. Then Grandma takes the kids to Wal-Mart of McDonalds? Click on any picture for a larger view, then your back button to return to the site. see my view of the storm by visiting the you tube link on the right. 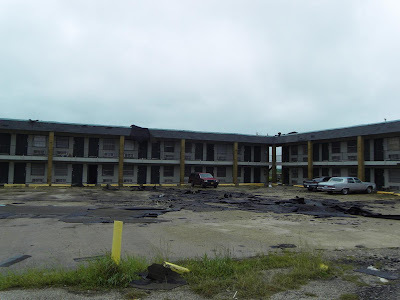 The shingles and roofing of a hotel ended up in their parking lot. I didn't know our new water meters were plastic. This one wanted to float away. The awning of a business on Hwy 34.